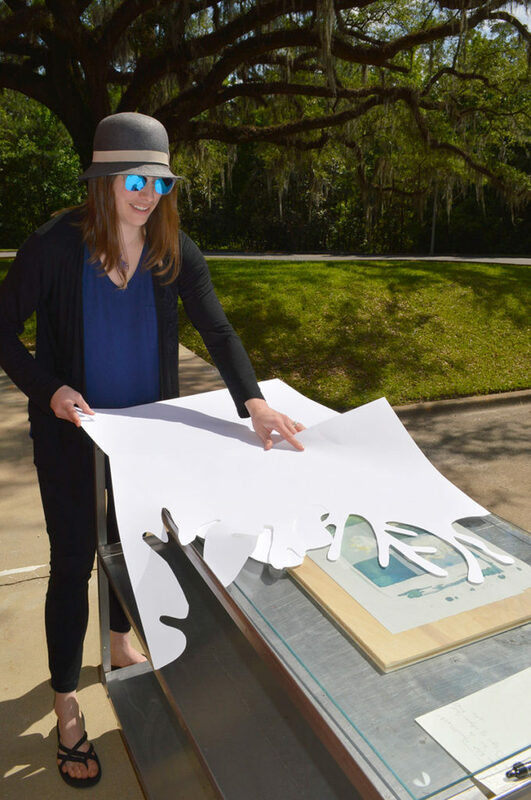 On May 1, Small Craft Advisory Press and the Facility for Arts Research welcomed Colorado artist Kim Mirus to Tallahassee to work on a collaborative project that combines visual art with current scientific research. Trained in traditional craft techniques, Mirus’s practice often addresses social and environmental issues, translating statistics into woven textiles. Her work develops in response to place, and her travels to Iceland and throughout the American West have inspired weavings on glacial retreat, sustainable agriculture practices, and declining natural habitats. At FAR, Mirus worked with members of the FSU community to develop an artists’ book in response to one of Florida’s most critical environmental issues: coral bleaching and Caribbean reef restoration efforts. The collaborative team included Sarah Lester, a marine biologist in the Department of Geography; Denise Bookwalter, FAR co-director and founder of Small Craft Advisory Press; and Elysia Mann, SCAP press manager. Mirus’s four-day visit included a trip to the gulf coast and long hours in the studio labs at FAR, investigating the combination of innovative fiber and printmaking techniques. This on-site visit serves as an integral part of a long-term collaboration that strengthens the connections of research being conducted at FSU to the broader national dialogue.